Synopsis: In a new Ice Age, where Earth has been frozen for 17 years, Snowpiercer is the only place for survivors. Climate change has made the planet uninhabitable. Those few who survived the planet’s demise live aboard a train that perpetually circles the same track with classes of people divided by cars. Over the course of a single year, moviegoers are likely to see numerous sci-fi films purporting to be the next Star Wars or The Matrix. These films try to sell their unique concepts and bombastic action sequences to the masses with a careless attitude, focusing on box office gold and little else. As a result, most of them end up falling flat. Getting sci-fi right is a tall order, and requires both a deft hand and a smart script. Luckily, Snowpiercer, the first English-language film from prolific Korean director Bong Joon-ho, has both. Set in the near future, Snowpiercer imagines a world where global warming brought humanity to the brink of extinction. Fearing another ice age, the powers-that-be decided to release a chemical agent into the atmosphere that would counteract the drastic global cool down. But what they actually end up doing is speeding up the process, turning nearly the entire world’s population into popsicles. After that radical freezing, all that remains are several hundred humans onboard the “Rattling Ark,” a supersonic train whose speed protects it from the harsh weather. This train is no ordinary train, mind you, but is an entire ecosystem on wheels, boasting its own power and food sources. It even has a caste system of sorts, where the rich reside in the front part of the train, and the poor, most of them stowaways, keep to the back. Curtis (Captain America‘s Chris Evans) is one of those stowaways, a headstrong leader-type who has been slowly inciting revolt in his fellow passengers. Curtis believes that if he can get to the front of the train he can upset the delicate balance that exists between the front cars and the back cars, taking control from the rich and privileged and putting it in the hands of the poor. It may seem insurmountable given the train’s intense security measures and the tight quarters, but Curtis believes his revolt will be the one that finally reaches the engine. From the very beginning its abundantly clear that Snowpiercer is a film that wears its allegories and symbolism on its sleeve, but few sci-fi films don’t. What sets this film apart from the pack, however, is its ability to slowly feed the audience clues without being overly expository. By the end, you feel like you understand who these train passengers are and what their life was like, but you never get the sense the film is doing anything but building momentum. The same is true of Snowpiercer’s art direction, which helps breathe life into each and every one of the train cars. As Curtis advances closer to the engine, the film uses each new train car as a way to unwrap a new part of its story while also reinforcing its sense of place. The world building in the film is exquisite. Snowpiercer‘s cast is also top-notch, boasting an eclectic mix of A-list stars and celebrated indie players. Tilda Swinton is particularly enjoyable as the devilish yet comical Mason, one of the “overlords” of the train, but Jamie Bell, Octavia Spencer, and John Hurt are also great as members of Curtis’ resistance effort. Ultimately, though, it’s Evans who carries the film, bringing his action chops to the fight sequences while also flexing his dramatic muscles when the scene calls for it. He may be Captain America in most people’s eyes, but this is Evans’ best performance to date. Snowpiercer is in a class of its own when it comes to sci-fi, uniting an intriguing and layered back-story with a compelling, fast-paced plot. There’s a lot to cover in the film, but Bong Joon-ho was more than up to the task, and luckily he surrounded himself with some very talented people; in particular star Chris Evans and set designer Petr Bouska. Put simply, Snowpiercer is the sci-fi film true fans of the genre crave: it’s well crafted and it doesn’t pander. Sure, like many great entries in the genre, the film has its faults, but the smart set-up and tremendous world building overshadow any logical inconsistencies or underwhelming story beats. 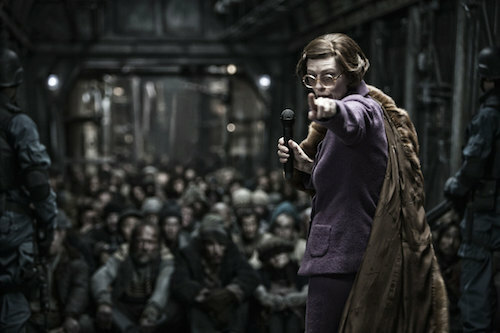 Take a break from the spectacle-filled blockbusters of summer and give Snowpiercer a chance; you won’t regret it. If there is one major flaw to Snowpiercer it’s the ending; or rather the why of it all. Up until the film’s climax, Joon-ho along with co-writer Kelly Masterson had tried their best to buck conventional Hollywood trends with a story that was both compelling and intriguing. Peeling back the layers in Snowpiercer is the best part of the film – trying to decipher these character’s back-stories and how this speeding Ark came to be. But when it comes time to pull back the blanket completely, the film fails to stick the landing. Instead, it resorts to what are largely familiar story beats and cliche plot twists that have been done countless times before, and most especially in the sci-fi genre. 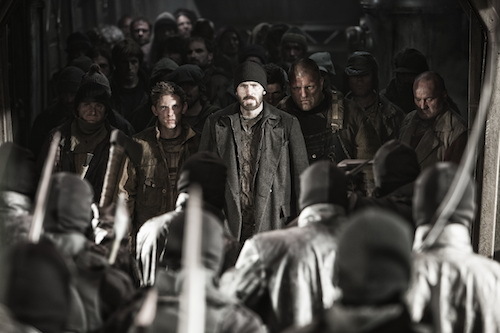 It isn’t enough to derail Snowpiercer completely, but the film’s inability to pull everything together in an engaging and original way does squander some of that earlier momentum. You feel like Snowpiercer is building to something big, but what the filmmakers consider “big” or meaningful is a little disappointing. Overall, though, the film is well written and smartly constructed with its sci-fi world-building, it’s just a shame it couldn’t tie everything together better. Although Snowpiercer is set exclusively on a dank, overcrowded train, it somehow finds a way to deliver some of the best action seen this year. Bong Joon-ho crafts set pieces that are not only exciting on a visceral level but a visual level as well. It would have been easy to get lost in such tight quarters, but Joon-ho composes his action with a deft hand. One sequence, in particular, a claustrophobic brawl between the train’s security forces and Curtis’ resistance, plays with night vision, total darkness, and dimly lit torches to create an unexpected level of suspense. It’s easily one of the best action sequences you’ll see all year.